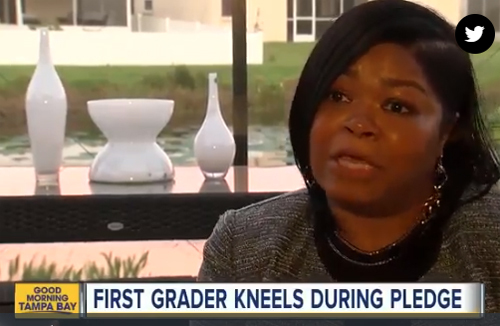 That boy’s mother is speaking out because of a text message she received from her son’s first-grade teacher about the incident. The mother doesn’t think that the Pasco County School District takes inclusion and diversity seriously. Standing for the pledge is state law. No matter; the pint-sized Malcolm X is black. The whole point of the anti-American antics that now define the NFL is to bully people into accepting that laws should not be enforced when they are violated by persons of politically preferred pigmentation, because racism. The moonbat mom sides with her misbehaving child. On a tip from Byron. Cross-posted at Moonbattery.